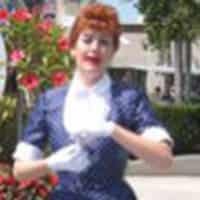 She has had extensive experience as an interactive entertainer at corporate and special events in Florida and nationwide. 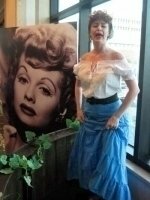 Her uncanny impersonation of Lucille Ball has delighted party-goers from around the world as well as other colorful characters she has either created or impersonated. She served her theatrical apprenticeship at the famed Williamstown several original stage productions and appeared in films, commercials, and soap operas. As a member of Actors’ Equity, she toured in the national company of The Sound of Music with Debby Boone. Her regional and summer stock theatre credits include leading roles in the musicals Show Boat, A Little Night Music, Pal Joey, The Sound of Music, Candide, , Lend Me a Tenor at the Ring Theatre and An Evening with Cole Porter at the Miami Shores Theatre. She discovered corporate entertainment while performing in revues of The Phantom of the Opera and Sunset Boulevard at corporat gatherings. This led to the development of her characters, and acting at special events became her specialty. She co-starred in the original musical comedy revue, Lucy,We Have Company! , and most recently performed as “Lucy” with the Philadelphia Boys Choir at the Broward Center for the Performing Arts in Ft. Lauderdale.